When I went to Hawaii a month or so ago, I wasn’t feeling too great about my physical self. I really do like almost everything about my body (I know, that’s a big statement. It’s taken me a while to feel that way), but I go through cycles where I’m more content or less content with the way I feel about my physical fitness. 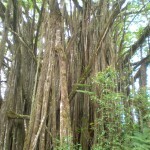 When I got to the island for the three week stay, I was already three weeks into the resumption of my workout routine. Typically, it takes six weeks for me to see a difference once I start working out, so I was pretty sure I’d be feeling good by the time I left the island…as long as I kept working out. I was feeling the effect of two months of over-eating in Italy. And while I walked a crap-ton, I didn’t do a lot of cardio or weight training. Things had shifted around in a way that made me uncomfortable in my skin, so I was committed to getting back to a place where I was happy chillin’ in a bikini. The condos had a decent gym, so I took advantage of the fact that my body was still on Pacific Standard Time, and got up early every morning to hit the elliptical for a good workout and then fell into my weight-training routine from college, something I’m super-happy to have in my memory bank. It took about a week to see a change in the way I was feeling. This was interesting, because it should have taken at least three to see an actual, physical difference. I’m not sure my body changed much in the first week I spent in the gym, but the way I saw my body sure did. I expected this to happen at some point. I’ve gone through enough of these cycles to know how it works, but this time it was pretty dramatic. It might have been due to the fact that I was also spending a fair amount of time in the sun, or the fact that I was texting non-stop with a beautiful woman. It’s hard to say, really, but at the end of the first week, I felt good. Really good. I was excited to put on the bikini to go to the beach. I stopped trying to hide the parts of me that I was least happy with. I laughed, met people’s eyes, and even smiled at the super-cute lifeguard at the beach. I took time for myself, thought through the next steps in my life, and felt generally excited about being me. Not because I looked any different, but because I saw myself differently. I saw the beauty above all else. People were beautiful. I mean really beautiful. I even turned to my mom at one point and said, “You ever notice how when you think you’re beautiful, everyone else is beautiful?” And it’s true. When things are working right for me, I project beauty out into the world, seeing everyone at their best, because I see myself at my best. I forget that I’m beautiful. It’s not just about physical beauty. That part’s easier. I forget about my inner beauty. But I understand when other people aren’t at their best. I give them a break. When they cut me off in traffic, or say something mean, or just act like they don’t care about what they’re doing, I understand. They forget that they’re beautiful, too. I know how that feels, so I’m able to see it, and to have empathy. For them. But I’ve had a hard time when it comes to me. I’ve beat myself up for not seeing the beauty in me, and then for beating myself up. I’ve beat myself up for not having empathy for myself. It’s a vicious cycle, really. But what I do have is fantastic friends. People who see the beauty in me even when I’ve forgotten. The ones who give me a break when I cut them off in traffic, say something mean, or just act like I don’t care. They’re the people who have empathy for me. So I think maybe, if I can see myself as a good friend, as someone who I care about, who has just forgotten how beautiful they are, I’ll be able to have a little empathy. And to give myself a break. And isn’t that all we really need? To be our own friend? To give ourselves a break? To see how beautiful we are, so that we can see the beauty in others? I think yes. 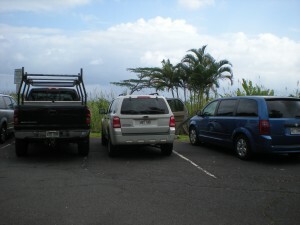 Once a visit, my family piles in the rental car to head around the island of Hawaii. 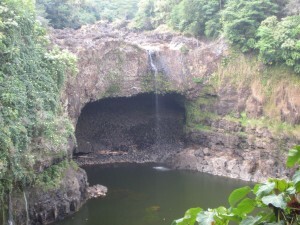 On the agenda is a stop at several waterfalls, a trip to the Hilo farmers’ market, and a journey out onto the volcano. Oh, and food – lots of food. 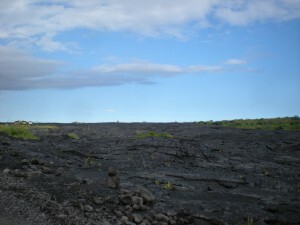 Kona is on the Southwest side of the island. That’s where the condo is: our starting point. 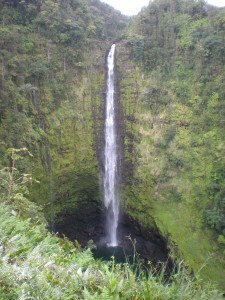 After a fabulous breakfast of avocado bagels and papaya, we set out in search of Akaka Falls – a fantastic waterfall on the other side of the island. 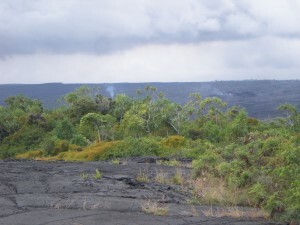 On the way, we drove through barren lava fields, lush grasslands, and tropical rainforests. Hawaii is a feast for the eyes, as well as the mouth. 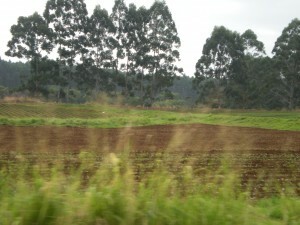 The deep red soil contrasts with the green vegetation, making agricultural fields especially beautiful. 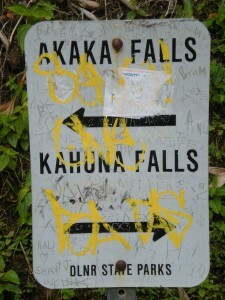 Once at Akaka Falls State Park, we piled out in search of the bathroom. 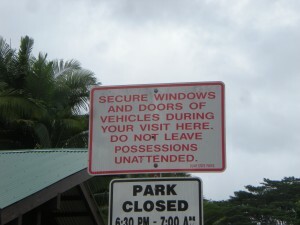 As instructed, we checked our belongings and made sure the car was locked. Then we headed down the trail that leads through the rain forest to the falls. The park is truly beautiful. 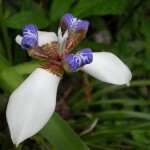 The well paved paths and new handrails make the walk relatively easy, as it winds through giant bamboo, enormous banyan trees, and a thousand other exotic flora. The foliage is so colorful and shiny that it looks like it could be part of a resort – planted specifically for our entertainment. 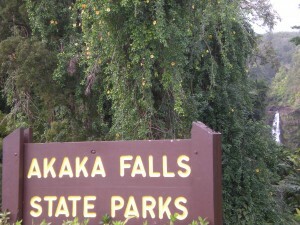 The park houses two sets of falls: Kahuna falls, the smaller of the two, and Akaka Falls. When we visited, Kahuna was virtually non-existent. Even though it’s winter right now, the precipitation seems to be less than usual. Mauna Kea, the “white mountain,” which usually has a bit of snow visible, is brown this year. Akaka falls was the main event, anyway, and it was beautiful, pouring out over the cliff and dissipating – falling as mostly mist to the valley floor. 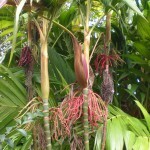 We took our pictures, and marveled at the gorgeous plants all around us. And then we headed back up the trail to the parking lot and the truck. Brilliant. While we took our time along the trail, the door of the truck stood open. Oh, it was locked, alright – just open. We were probably suffering delusions from hunger… Slightly aghast, we filed in and set off in search of our first snack of the day. We’d seen a bakery on our way to the falls, in a set of little, old-west storefronts along the road in the little town of Honomu. Most people were hoping for coffee. I was hoping for malasadas – Portuguese donuts. 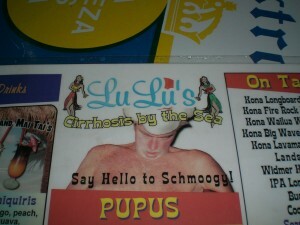 I’d been introduced to these little gems on a trip to Oahu with some of my Hawaiian friends. They’re thick, airy, and coated in sugar – or as I like to think of it, pixie dust. 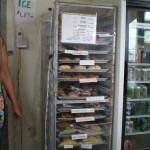 We walked inside Mr. Ed’s Bakery and found a case of fantastic looking pastries, most of which were clearly some variation on Hawaiian sweet bread. But no malasadas. 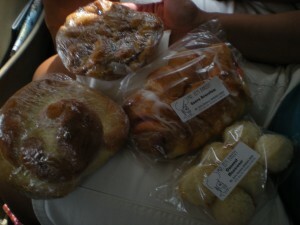 So we picked out a good variety, including a guava bear claw, macaroons, monkey bread, and an ensaymada – something that was described as “Hawaiian sweetbread, butter and sugar.” I thought that would translate into a butter cream frosting. I was wrong. It was whipped butter and sugar spiraled in a sweetbread Danish. Amazing. 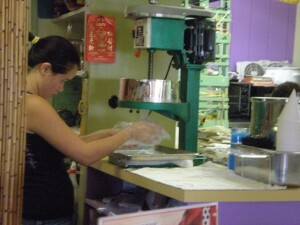 I asked the woman behind the counter where we could find malasadas on our way to Hilo. 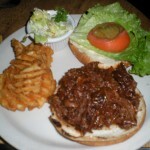 “Baker Tom’s. It’s about three miles up the road on your right.” Excellent. Just enough time to inhale the pastry we’d bought at Mr. Ed’s. Nobody else in the car was familiar with malasadas, but they were game to try new pastry, and my description gave them an alarming level of enthusiasm. We climbed back into the car, and headed to the main road, checking the odometer first. 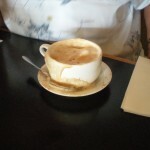 The bakery hadn’t had coffee, and we didn’t want to miss our chance for coffee and malasadas at Baker Tom’s. We tore into the freshly purchased pastries, pulling long strips of the bread off and passing gooey handfuls of plastic wrap around the car. And then we saw it. 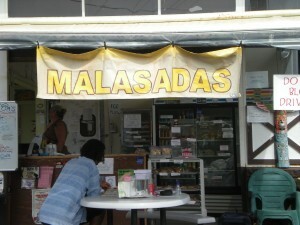 “MALASADAS” the banner read, stretched across the front of a converted auto mechanic’s shop. “MALASADAS!!! !” we all screamed as dad turned sharply into the drive. The people sitting on the little picnic table in front of the shop must have heard us yelling or seen the insane glint in our eyes as we came hurtling through the parking lot. At once, they all stood up from the work they had been doing, scattering to different parts of the building, and making room for us. We were crazed. Mom practically ran up to the register, asking frantically, “you DO have malasadas, don’t you?” The lady behind the counter, dressed in a Hawaiian print apron, looked down at us with an expression of concern, and nodded. She pushed her head through the swinging door that separated the small storefront from the crowded bakery, checking with someone in the other room. She reemerged and motioned to a case. 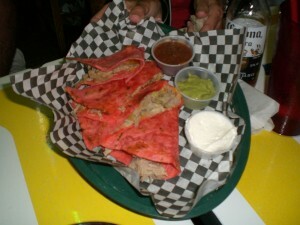 Our hands still sticky from Mr. Ed’s, we placed our orders and received the fried wonders with awe. It’s possible that we got a little carried away. 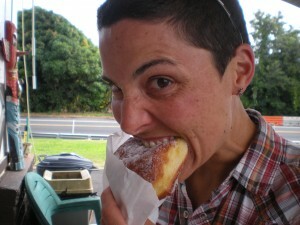 But the malasadas were good. They were chewy and sugary and good. Even the slightly burned coffee tasted perfect to us, perched on the picnic table. 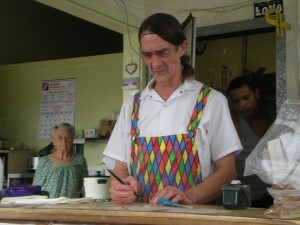 As we were brushing the last remnants of sugar from our faces, a lanky guy in a hairnet and a harlequin apron appeared. Baker Tom wasn’t exactly what we expected, talking with Dad about a custom leather shop. But he could have had 2 heads for all we cared. He made a mean malasada. And we were all high on sugar. We yelled our thanks to the folks at Baker Tom’s as we returned to our chariot. From there, our engines fueled, we headed toward Hilo, where we planned to have a nice lunch (heaven forbid we didn’t have a plan for eating). But first, there were more waterfalls to see. The spectacular Rainbow Falls, known for its horseshoe-shaped falls, was just a tiny trickle, splashing almost comically into the giant pool below. Our tour book told us that the “boiling pots” were just a mile up the road, so we headed there. 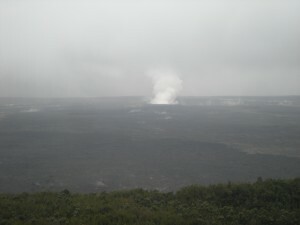 Supposedly, the formation of the rocks is such that, during periods of high rainfall, the water rushes through the lava basins, boiling into the air. Evidently, in periods of not-so-high rainfall, the water trickles through the pools, creating a peaceful, comfortable atmosphere, but no boiling. The pots were definitely more than a mile up the road, but we eventually found them, just as we were getting ready to turn around. I really liked the feeling of this park. A wide grassy area buffered the falls from the parking lot, and the view down onto the pots was pretty spectacular, even with the low water flow. We were almost the only people there, which added to the sense of peace and privacy. I snapped a couple of pictures, listened to the water, and then ran around the park, still jacked up from the sugar explosion, and hoping to blow off a little of the nervous energy flooding through me. It’s a lot harder to pile into an enclosed space with four other people when all I want to do is run around. 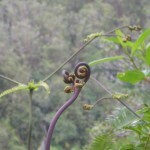 Still, the ride to Hilo wasn’t a long one. 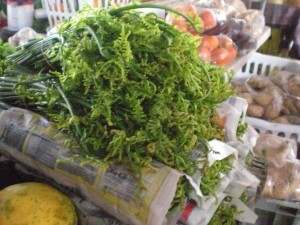 Saturday is market day in Hilo. 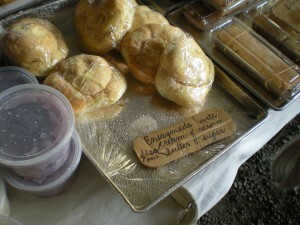 Vendors bring their produce and baked goods, and they also bring their crafts, arts and other stuff to sell. 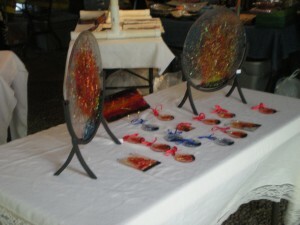 My favorite booth was a display of beautiful glass panels, drizzled in red or blue; capturing the fire and water of the island. I chatted with the owner, who was very proud of the process he has developed for creating the beautiful pieces. 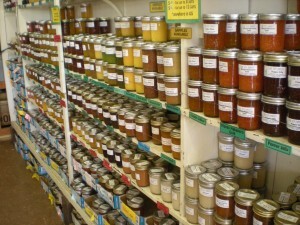 The food area of the market is jammed full of vendors selling their home-grown products. 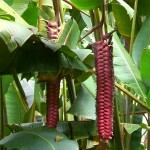 Along with avocados and papayas there are more exotic purple sweet potatoes, and ferns. And there were more pastries. Ensaymadas, malasadas and mochi lined the little tables. Even though it had been like an hour since we ate pastry, we held off this time. Instead, we headed to the Pesto Café for lunch. There was a wait, so we put our name in and walked into the little discovery center next door. Cool. 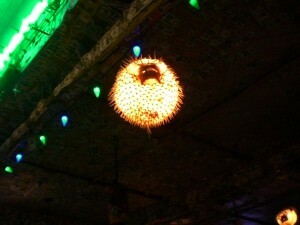 The walls were papered in underwater pictures, with little doors opening onto video screens or aquarium tanks. A digital screen doubling as a tabletop in the middle of the room explained the formation of the Hawaiian islands. 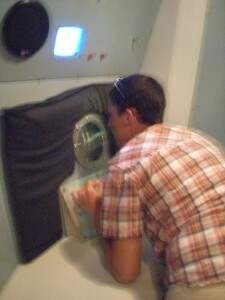 And, hidden in the back corner, was a mock-up of a submarine interior. I grabbed Dad and we headed in. There were two stations set up, each with a little round window onto an underwater salvage scene, and controls for the underwater robotic arms. Too fun. We played with the robots until we got the call that our table was ready. I would have stayed longer in the little room, flipping switches, and making the metal fingers grab at the sand on the other side of the glass. The Pesto Café is set in a high-ceilinged colonial-feeling building with slowly turning fans and big windows. 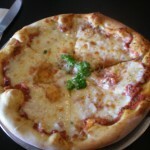 Lunch was good, consisting mostly of tasty pizzas, and overfull cappuccino. We ate about half of what we ordered, and packed the rest with us for an afternoon snack. 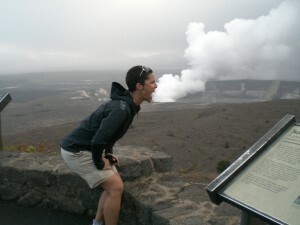 Our next stop was the volcanoes, and the volcanoes always make me hungry. The Big Island of Hawaii is my favorite island so far. 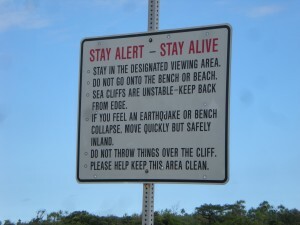 It’s striking – looking from the beach up over the high desert or the jungle to the top of the Mauna Kea observatory. From the blast of flowery, hot air that hits me in the face when I step off the plane, to the birds that wake me in the morning, I enjoy being here. Yesterday was a good sampler day. We hit a beach for some sun and boogie boarding, watched whales throwing themselves into the air, had lunch in an old-school café, and looked over cliffs onto a stunning black-sand beach. 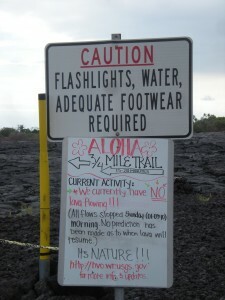 I’m staying with my parents on the Kona side of the island. We’ve been coming here for over 15 years. At this point, it really does feel like a home away from home. This 3-week trip is the longest time I’ve spent in the island. It’s a long time. Still it’s nice to feel like I can pass on activities one day without fear of missing out. I know we’ll go snorkeling more than once, and the beaches are always there. After a breakfast of papaya and apple bananas from the local farmer’s market, yesterday’s Hawaiipalooza started with a trip to Hapuna State Park. This beach, about 30 miles north of Kailua-Kona (the big city and airport on this side of the island), is awesome. The beach itself is about half a mile long, and super wide. 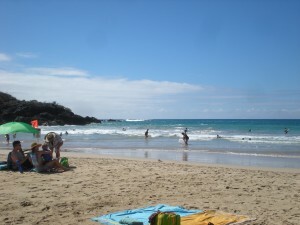 There’s plenty of parking up top and a short walk to the ultra-fine white sand. 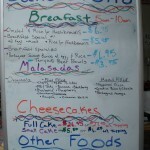 There are bathrooms, showers, covered picnic areas and a burger shack just up from the beach. But that’s not the important part. 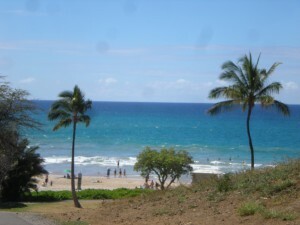 Hapuna is gorgeous. The sand runs up from the turquoise water to the green bushes that grow along the coastline. 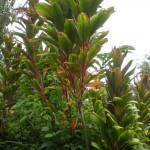 (Snorkling tip: The leaves of the beach naupaka plant, which grows along a lot of the beaches, can be crushed and wiped on the inside snorkel masks to cut down on fogging. It’s at least as effective as spitting.) The bay is protected by lava outcroppings on either side that send the incoming waves crashing into the air. 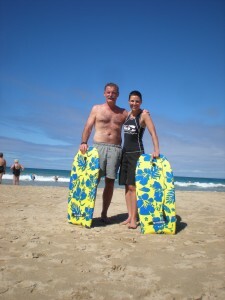 Some people come for the swimming and snorkeling, but on wavy days they come for the boogie boarding. Depending on the size of the waves and the strength of the current (marked on beach signs), the waves range from gentle for beginners, to expert only. The past couple of days have been red flag days, meaning there’s the possibility of high surf. With our little, drugstore boggie boards, we hit the waves until the lifeguard started announcing “advanced body surfers only” from her bullhorn. It was pretty much great. Dad ended up snapping a board, and I laughed like a little girl as the waves sailed me through the air and then brought me bouncing down into the surf – over and over again. After a morning of such rigorous activity, we were pretty much starving. There’s something about a combination of sun, sand and surf that makes me ravenous. 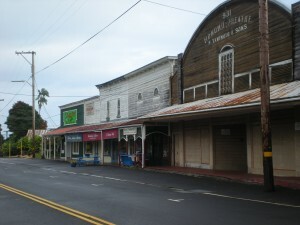 One of our favorite places on the island is the town of Hawi. 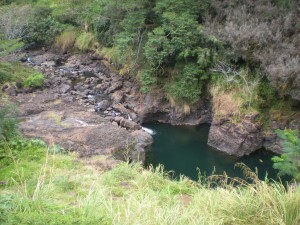 Situated in North Kohala, Hawi is a super-charming look at old Hawaii. For sports buffs, it’s also the turnaround for the bike portion of the Ironman. 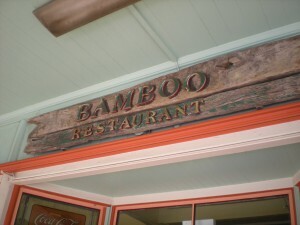 We go there to browse the shops (there’s a great crystal shop there), eat ice cream on the main strip, and for lunch at the Bamboo Restaurant & Gallery. 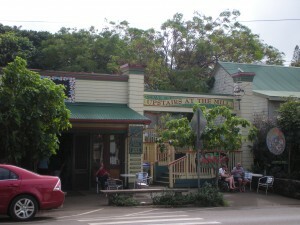 The place was a hotel at the turn of the last century, and has a colorful history right out of the old west, starring horses, traveling workers and “ladies of the night”. 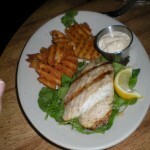 The food is great and the service is delightful. My favorite is the Hawaiian veggie stir-fry. 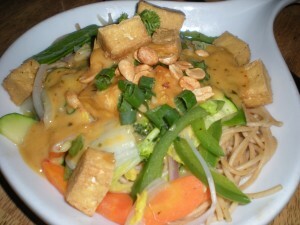 I get it with tofu, Thai coconut sauce, and this year, whole wheat noodles. I’m not much of a fan for fried tofu, but this stuff was perfect. Fresh and slightly crispy, it had none of the sogginess that plagues badly done tofu. 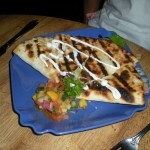 Yesterday, the table also hosted a kalua pig (cooked in a pit, not with the liqueur) sandwich with pineapple slaw and waffle-cut fries, a mon chong fish-plate, and a quesadilla. The menu provides tons of options – almost everything can be done with pork, chicken, fish or tofu – and the food itself is really tasty. 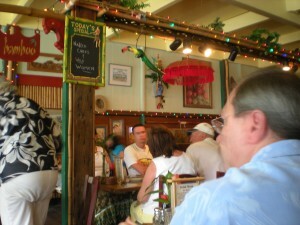 Directly across the street, is the Kohala Coffee Mill, a little complex that serves all manor of treats. You can get Kona coffee and mac-nut ice cream at the parlor downstairs, or fudge samples and shave ice – the real kind that they shave right in front of you – upstairs. 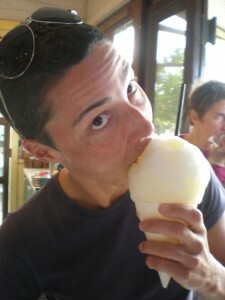 I need to have at least one ginormous shave ice during my trip to the island. Yesterday was the day. 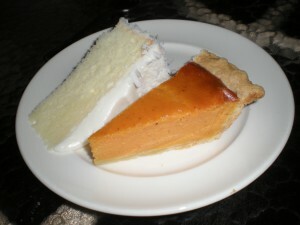 My favorite combo is two-flavor pina colada and peach. The more traditional shops serve it with either ice cream or red beans in the bottom of the paper cone. I like mine with a scoop of vanilla ice cream. Tasty. The flavoring melts down to make a slushy, sugary smoothie in the bottom that can be sucked out with a straw. Yummy. 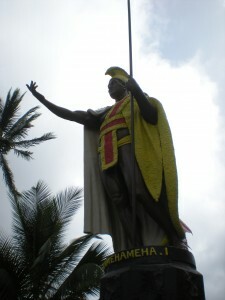 Just up from Hawi is the village of Kapa’au, and the statue of Kamehameha the Great. The statue has a fantastical history, including the shipwreck and salvage that brought the statue here instead of Honolulu, it’s original destination. From there, we headed up to the end of the road – literally. 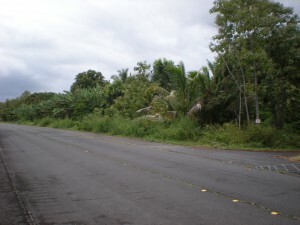 The road through Hawi rings the island, except for the stretch where the Kohala mountains stretch up in great cliffs, and empty their rain-forests into the ocean. 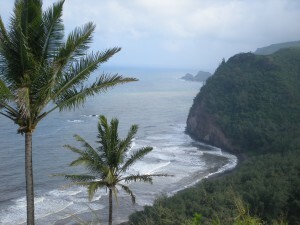 The Pololu lookout provides exceptional views of the forest, cliffs and black-sand beach. A trail at the end of the road leads down to the beautiful – and rugged – beach and a beautifully peacefully tree-covered area where you can listen to the crashing waves, and feel completely nestled into the island. Yesterday we stayed at the top and watched as triumphant hikers emerged from the trailhead, grinning and sweating. The island is pretty amazing. 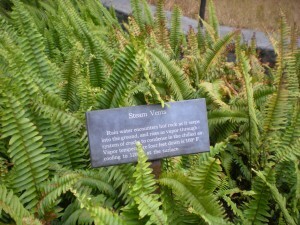 Eleven of the world’s fifteen climate types can be found on the island. Yesterday’s hour drive from Kohala to the Kona coast took us from dense rain forest that looked like it could be South America, and across high-desert that could put you in southern Idaho. 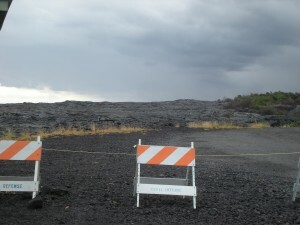 And then there’s the lava. Great stretches of lava look like they’ve tumbled out of the earth yesterday, covering swaths of land in a black, rich blanket. People create graffiti using pieces of coral, stark white on the lava background. The island is simply beautiful. Last night, after a long day of adventures, we settled in for dinner on the patio – the lanai. Looking out over the lava and the golf courses, up into the hills around Mauna Kea and its observatories, we ate sushi, sweet potato pie, and haupia (coconut) cake. We relived the day – and planned the next set of adventures. 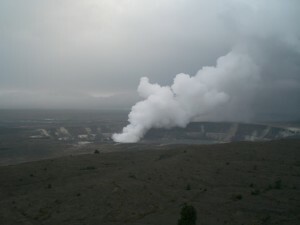 Tomorrow we’re heading around the island to Hilo and the volcano. To the jungles and waterfalls. And I’m sure to more food. Always more food.